A properly groomed Airedale terrier is a handsome dog. The loyal, regal Airedale terrier is often called the "king of terriers." Originally bred as a varmint and small game hunter, he was named for the Aire Valley in York County, England, which is rife with small game. One of the Airedale's most notable features is his beard. 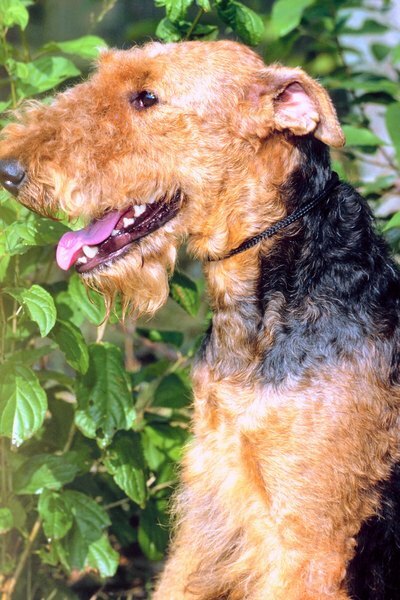 Listen to discussions among Airedale terrier owners and you will discover they usually agree on one thing -- that the Airedale's beard was designed to hold water. Lots of it. His shaggy beard will absorb water from his bowl and he will carry it around, spreading it all over the house and happily sharing it with his human. To add insult to injury, Airedale terriers are known to have a sense of humor and enjoy playing practical jokes, which means he actually might enjoy getting you wet. The next best thing the Airedale terrier's beard is good for is catching and storing food crumbs. A bit of a rascal by nature, you may find bits of your own dinner he has stolen from the kitchen counter trapped in his beard along with remnants of his kibble. Some Airedale terrier owners complain that the beard begins to smell if not washed regularly. Daily washing is highly recommended. The primary function of the Airedale terrier's beard is to protect the dog's sensitive muzzle from twigs, thorns, branches and the gnashing teeth of small game as he hunts them through the woods. The animals he was bred to hunt include otters and rats, and the Airedale terrier would find himself digging into the ground and poking his snout into dark places in search of his quarry. Should thorns or brambles fall into his path, or a small animal turn to defend himself, the Airedale terrier's beard gave him a measure of protection between the assailant and his skin. Airedale terriers have brittle, wiry coats with hair that is easy to pull out. Coat care recommendations suggest a professional grooming two to three times per year, which involves pulling out the old hairs. Tedious and an hours-long process, pulling the coat can be learned fairly easily. This process removes old, dead hairs and prevents the coat from becoming overly curly and unruly. Regular brushing also helps keep the Airedale terrier's wiry coat in good shape. The beard should be washed with a gentle shampoo on a daily basis, since it will attract and collect various debris throughout the day. Regular, gentle brushing or combing of the beard will keep it looking neat.